"Fitness Guru Teaches Proven Industry Techniques For Safe And Painless Hamstring Injury Treatment ... Heal That Stubborn Pulled Hamstring Forever!" My name is Loris Bertolacci and I'd like to welcome you to HamstringTreatment.com. If you've been struggling with a hamstring injury that just won't heal, then you should read this letter from start to finish. I worked for years managing the fitness of elite Australian Rules Football Players, dealing with and preventing hamstring injuries. High performance coaching is in my blood - my sister is an elite netball coach, my brother-in-law has coached track-and-field athletes at the world level, and my daughter is a professional volleyball player. In just a few minutes, you can learn techniques which have taken me years to develop. Maybe you just felt a tweak in your hamstring one day. You tried to push through the pain for a little while but it didn't go away - you finished whatever you were doing, went home, and expected the injury to go away. The next time you try to run or jump or do anything with your hamstring, it's still tight - maybe you're even limping. Weeks pass, you rest a little bit, then try to return to training - but you just can't kick the injury. Every time you use your hamstring, it hurts, or limits you in some way. If this describes you and you are serious about healing that pulled hamstring, then please take a few minutes to read this letter very carefully. I remember the first time I had a hamstring injury. I was out sprinting, I didn't warm up enough, and by the end of the session I was limping. Months later, I still couldn't run as fast as I could before the injury, and if I pushed too hard that darn muscle would start hurting again. I went on to work as a fitness adviser for a club in the Australian Football League - a sport notorious for hamstring strains, and like everyone I at first struggled to manage the heavy stress this put on the team. In 1997, I started to learn the lessons that challenged everything I knew about hamstring treatment. In 1997 I went to the Australian Institute of Sport to examine their training methods. This was a big step for me; I changed a lot of my methods after that trip. Muscle imbalances, core stability, collecting statistics, assessing injury severity - all this new knowledge came together to see a large drop in hamstring injuries in 1998 at the club I worked for. I went on to become the full-time fitness coach at another football club, with great success. One year we got 4/5 of the way through the season without a hamstring injury, an unprecedented result. People kept telling me: "Loris, you should write a book about hamstring prevention." So I finally did, and now you can benefit from my decades of experience treating and preventing hamstring strains. 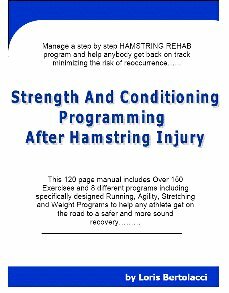 In 120 pages you'll learn every secret the pros know about successful hamstring rehab and how to "get-back-up-to-speed!" Learn the techniques used in high-performance environments, including Australian Rules' Football Clubs. Choose from more than 150 exercises - no matter your strength, flexibility, or fitness, there will be exercises that are right for you! View over 250 pictures describing the exercises and stretches - EVERY exercise and stretch is detailed with descriptive pictures. Finally discover which stretches work and when to use them. Stop guessing how far you've come with our techniques to assess your progress. Compare your progress to the statistics of real elite athletes! 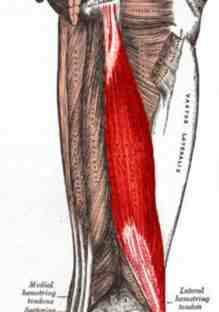 Are weak core muscles causing your hamstring problems? Find out! Harness sports specific advice to tailor your recovery to the way you use your body. Learn surprising and critical information on when to rest, when to work hard, and how hard to work. Discover the secrets of the pros, including a simple pain awareness scale that can keep you from reinjuring your hamstring! Learn how your own strength could be sabotaging your hamstring, and find out how to correct the imbalance! Read the dozens of citations of current injury healing literature throughout the book. "After I injured my hamstring muscle sprinting I spent weeks trying to ignore the problem. At the time I was doing a lot of backpacking and my hamstring would always be tight after a long walk. Finally, I spoke to Loris and his expertise helped me to recover from my hamstring injury in just a few weeks. Since then, I've used the advice in the Hamstring Treatment Manual to strengthen my body so it never happens again!" How Much Does The Hamstring Treatment Manual Cost? There are 119 pages and 2 sections in my e-book laying out everything you need to know about hamstring rehabilitation. Pay a personal trainer $50 a session for several weeks. Buy a dozen fitness books not specific to the hamstring for $100 a pop. Learn the lingo and read 100s of sports science papers and journal articles). Hire me personally - but I live in Melbourne, Australia, so that might not be practical for you - and I'm more expensive than the average personal trainer! OR you could just buy the Hamstring Treatment Manual for US$19.95 - a one-time, once-off payment. In a couple of short minutes, for US$19.95, you could be downloading my Hamstring Treatment Manual. This manual is easily worth $49.95 - people pay twice as much for half the information. Don't wait - buy now! Order Now and let's get started on healing your hamstring today!